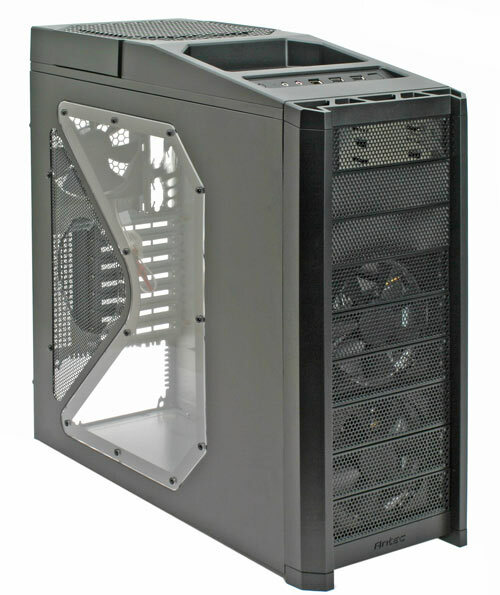 Ah, the venerated classic Antec Nine Hundred. Few cases have had the critical acclaim of this industry staple. Virtually silent, despite the massive cooling power of the 200mm TriCool exhaust fan and the three accompanying fans, this case is more than deserving of it's reputation. Three 5.25" bays will hold your optical drives, and up to six 3.5" drives can be installed in cages behind the fans, which can be arranged along the front any way you like. Always a pioneer in the field, Antec chose to put the power supply mount on the bottom of the case, a feature which has become almost standard in most top-of-the-line cases today. 200mm TriCool Fan: The Antec Nine Hundred features a unique top-mounted 200mm TriCool exhaust fan to cool even the hottest systems. Superior Expandability with 9 Drive Bays: The Antec Nine Hundred’s nine drive bays provide three possible configurations including 3 x 5.25-inch external and 6 x 3.5-inch internal drive bays, or 6 x 5.25-inch external and 3 x 3.5-inch internal drive bays, or 9 x 5.25-inch external drive bays. With the included 3.5-inch drive bay cover and Floppy Adapter, install a floppy drive in any 5.25-inch drive bay as well! Transparent Side Panel Window: The Antec Nine Hundred's transparent side panel window provides a direct view of the inner system and a 120mm fan can be installed on the side panel for maximum heat dissipation. Extreme Airflow and Cooling: The Antec Nine Hundred features one 200mm TriCool fan on the top, two 120mm front blue LED fans, one 120mm rear fan and optimized internal airflow for peerless cooling performance. Convenient Top I/O Panel and Top Power Switch: The Antec Nine Hundred’s top I/O panel delivers remarkably convenient access to two USB 2.0 ports, one IEEE 1394 port and two audio ports. The blue LED power and reset switches on the top provide convenient access when the case is placed on the floor. Dimensions(L x W x H): 18.40" x 8.10" x 19.40"